The signs of industry were everywhere visible. Even the [Peirce] academy students ... were employed during their leisure hours in making shoes. We entered a great many private dwellings and found women and children busy - boys as well as girls - either binding shoes, or braiding straw for bonnets, or occupied in some other equally useful way. Both shoe-making and straw braiding for the local straw hat industry were cottage industries pursued by Middleborough residents through the mid-19th century. Many farmers traditionally had been accustomed to producing shoes during the relatively slack winter months, and as the modern shoe industry developed in the mid-1800s, their skills were utilized to help produce rudimentary shoes and boots which were completed in local manufactories. Meanwhile, straw hat manufacturers established a similar system of rural outwork for local residents, primarily women, whereby straw would be provided for them to braid in their homes. The so-called "braid cart" would collect the completed plaits which were used to produce hats and bonnets in the local manufactory. Shortly after the Messenger's comment, the local production of both shoes and straw hats was centralized in large manufactories including Leonard & Barrows and the Bay State Straw Works. 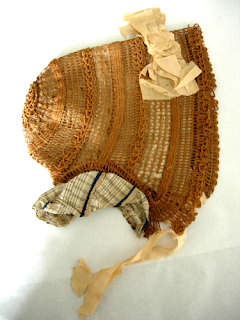 Bonnets manufactured of braided straw such as this were typical of those produced in Middleborough in the early and mid-19th century. Rural outworkers produced straw plaits in their homes which were later used by manufacturers to produce such intricate head wear and which promoted Middleborough's reputation for industriousness. Middleborough Gazette and Old Colony Advertiser, August 4, 1860.